Debian GNU/Hurd is currently available for the i386 architecture with about 80% of the Debian archive, and more to come! The core GNU Hurd and GNU Mach packages were updated to versions 0.9 and 1.8, respectively. Besides numerous other improvements, they bring vastly improved stability under memory load and prolonged uptime. The native fakeroot tool has been greatly improved, allowing to be used for building packages, making that quite faster and safer. It is now possible to run subhurds as unprivileged user, thus providing easy lightweight virtualization. The supported memory size was extended beyond 3GiB. Please make sure to read the configuration information, the FAQ (or its latest version), and the translator primer to get a grasp of the great features of GNU/Hurd. We would like to thank all the people who have worked on GNU/Hurd in the past. There were not many people at any given time (and still not many people today, please join! ), but in the end a lot of people have contributed one way or the other. Thanks everybody! Debian GNU/Hurd is currently available for the i386 architecture with more than 80% of the Debian archive, and more to come! The core GNU Hurd and GNU Mach packages were updated to versions 0.6 and 1.5, respectively. Besides numerous other improvements, they bring vastly improved stability under load and prolonged uptime. The networking drivers were migrated to user-space drivers using the NetDDE framework and a Linux-2.6.32 codebase. Notable new or upgraded packages which required considerable porting effort and/or are known to work well on Debian GNU/Hurd include Iceweasel 31 ESR, Xfce 4.10, X.org 7.7 and Emacs 24.4. It is with huge pleasure that the Debian GNU/Hurd team announces the release of Debian GNU/Hurd 2013. This is a snapshot of Debian "sid" at the time of the Debian "wheezy" release (May 2013), so it is mostly based on the same sources. It is not an official Debian release, but it is an official Debian GNU/Hurd port release. The installation ISO images can be downloaded from Debian Ports in the usual three Debian flavors: NETINST, CD, or DVD. Besides the friendly Debian installer, a pre-installed disk image is also available, making it even easier to try Debian GNU/Hurd. Debian GNU/Hurd is currently available for the i386 architecture with more than 75% of the Debian archive, and more to come! We would like to thank all the people who have worked on GNU/Hurd over the past decades. There were not many people at any given time (and still not many people today, please join! ), but in the end a lot of people have contributed one way or the other. Thanks everybody! Various bugs of the debian-installer based image were fixed, there is no known issue except that GNOME and KDE are not installable yet. See the Hurd CD page for further information. The debian-installer based image was updated to squeeze d-i packages. A debian-installer based image is available. The L1 DVD images are now available. The K16 CD images are now available. The K15 CD images are now available. The K14 CD images are now available. The K11 CD mini image is now available. The K10 CD and DVD images are now available. The K9 CD Images are now available. The K8 CD Images are now available. These Images support Filesystems bigger than 2 GB and feature an update of the network device drivers. After a long time of not being updated, new CVS snapshots of the Hurd and GNU Mach are uploaded. The K4 CD images are now available. See the Hurd CD page for further information. The K2 CD images are now available. See the Hurd CD page for further information. The J2 CD images are now available. See the Hurd CD page for further information. Upgrading Debian GNU/Hurd from a libio-based system before 2002-08-12 (including J1 CD series). Updating a Debian GNU/Hurd system in August 2002 requires to follow the procedure outlined in the upgrade manual. This update procedure is necessary because the Hurd interfaces went through an incompatible change to prepare support of long files. The J1 CD images are now available. See the Hurd CD page for further information. The H3 CD images are now available. See the Hurd CD page for further information. The H2 CD images are now available. See the Hurd CD page for further information. The H1 CD images are now available. See the Hurd CD page for further information. The G1 CD images are now available. See the Hurd CD page for further information. 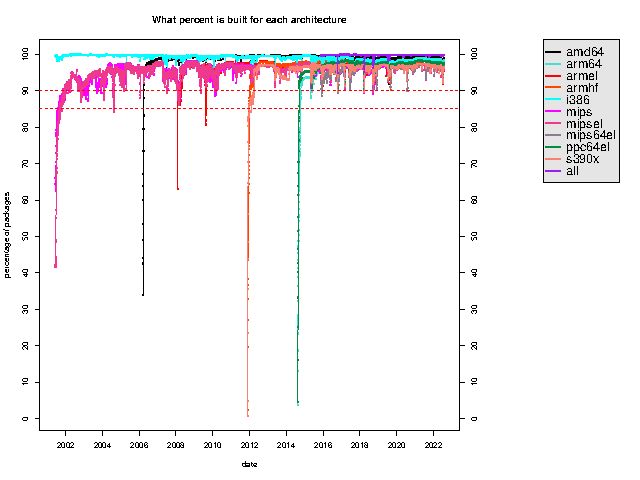 Today is the first time we crossed the 40% mark in the statistic about up-to-date packages per architecture. The F3 CD images are now available. See the Hurd CD page for further information. Cleaned up some outstanding bug reports which were closed by now. Going to upload some more packages, in addition to those uploaded in the last days (inetutils, grub, man-db, now coming hostname, mtools, ...). All those now compile without any changes, which is a good thing. Seems we are slowly stabilizing the basic set of packages. There are patches to glue Linux character devices into GNU Mach now. These patches are very experimental, and the tty driver does not work correctly with the term translator, but we are working on it and hope to be able to provide a binary soon. Note that this will bring the Linux console to the Hurd (including color and virtual consoles), as well as drivers for various non standard mice and other serial devices. I heard that some people are concerned about the size of GNU Mach, as well as it becoming a subset of Linux. Please note that we are only searching for a temporary solution here, until we have the time to redesign the driver interface in GNU Mach (or use another Microkernel). The microkernel is not at all that important as the Hurd servers are which run on top of it. On the package side, we have now a proper shadow package (which produces passwd (thanks, BenC!)). Also, man-db should work out of the box now even with long filenames, but I haven't checked the other changes. All in all, the base section is getting into a good shape. Torin has applied my patch for perl, and that's another package I have to check out if it can be `finalized' now. debianutils 1.12 does now compile without patch. Source NMU for passwd (shadow) should fix all remaining problems in this package. This should make for a smoother install. On the other side, mutt requires a small patch. New packages of the core system are finished now. The Hurd has a new way to boot (the part that happens after init is started), take a look at /libexec/runsystem. This is useful for the sysvinit package, which is almost done. Fixed a buglet in GNU Lib C and one in GNU Mach. Autodetection of all network cards should work now, but maybe we need to tweak the order a bit (3c5x9 before 3c59x). cpio 2.4.2-25 fixes the remaining Hurd compatibility issue and can now be compiled without changes. Thanks Brian! Perl 5.005.03 patches submitted to the maintainer. The upstream code was already clean (thanks, Mark! ), but the Debian packaging scripts were linux specific.